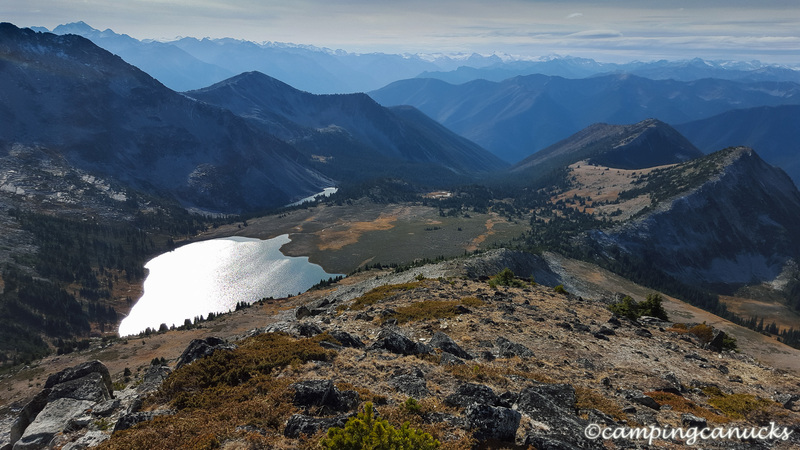 We have done many trips into the lower valley of the Stein Valley Nlaka’pamux Heritage Park as detailed in an earlier post that we wrote but for a long time now, we have wanted to explore new and more remote areas of the park. 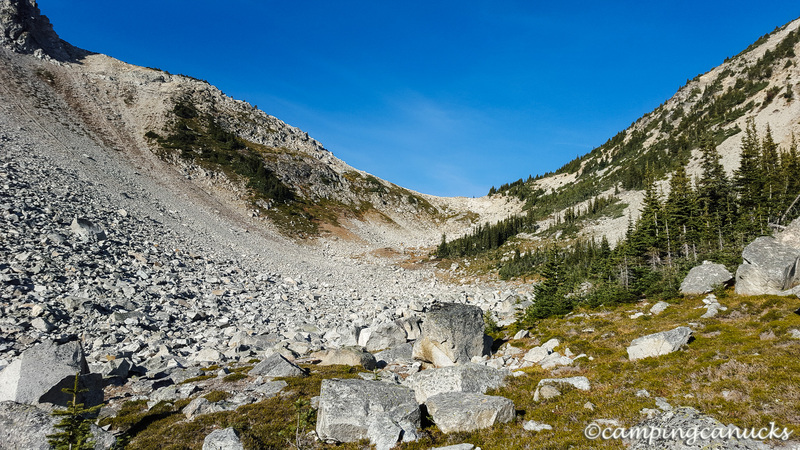 We had in fact planned for a trip into the Blowdown Pass area of the park in September 2015 but unfortunately, we were not able to make that trip. 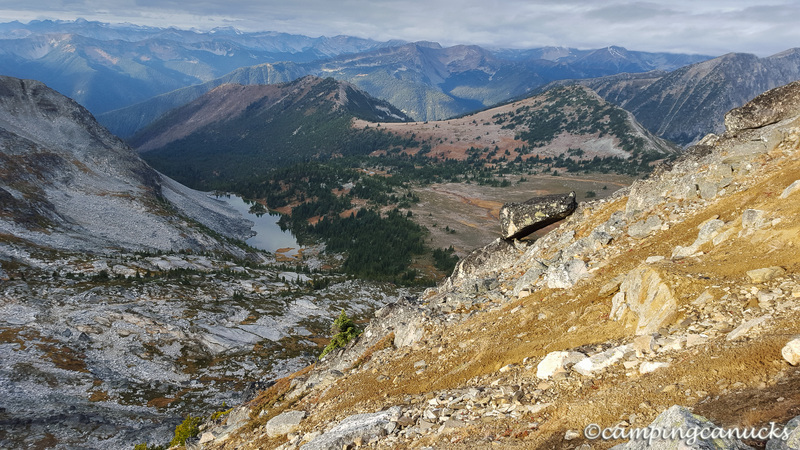 So, while coming up for a place to do an overnight backpack in October 2015, Anthony and I decided to tackle the Brimful Lake Trail since the weather in the region looked far more promising than any of the other places we had in mind. Being that we had a few hours of driving ahead of us, we got a 4am start on a Saturday morning to drive to the trailhead. Since information as to what condition the road would be in was pretty scarce, we figured we’d best start early in case we ended up doing more walking than expected. Fortunately we found that the road was in excellent condition until about 5kms from the start of the trail. That is when we started to encounter big ditches across the road that had been fairly recently dug. As I have 4×4 truck with fairly high clearance, we decided to drive through many of them until we reached one that was too deep to cross. The verdict is still out whether that was a good idea or not. The skid plates of my truck took a lot of dents. That said, the ditches did appear they were being prepared for culverts so perhaps the road will be drivable all the way to the trail head in the near future. After parking, we had about two kilometers to walk along the road until we reached the trail head which was marked with lots of flagging. 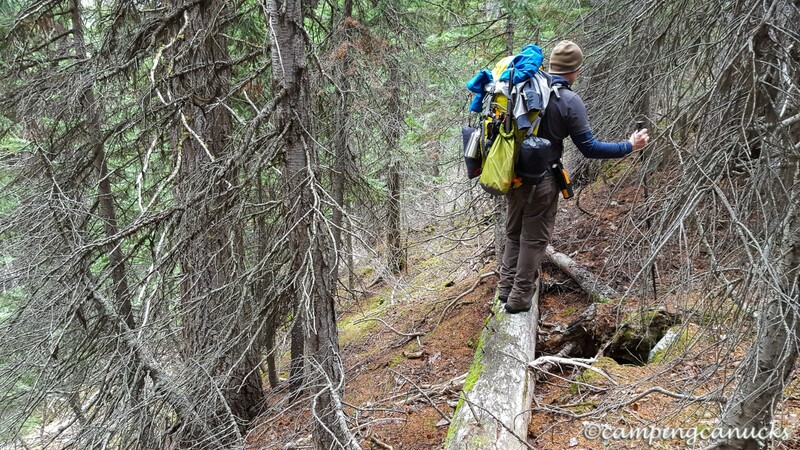 The first part of the trail crosses a cut block until we entered the trees. The section through the trees was only a couple of kilometers long with a steady climb until we came out of the trees and could see the pass ahead where the trail continued. 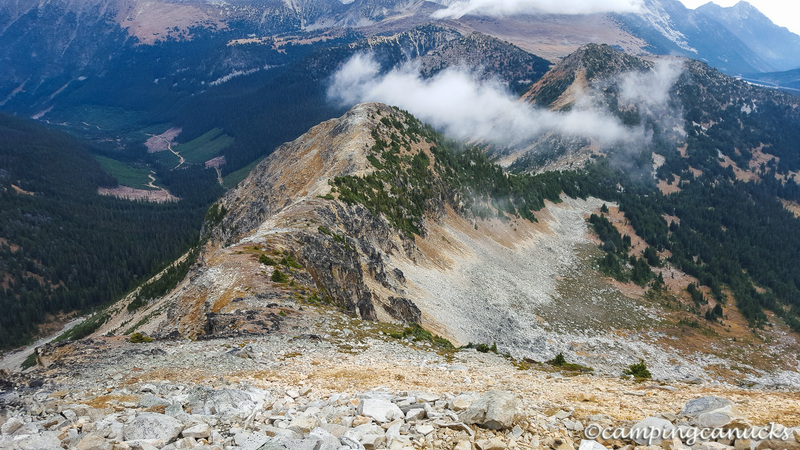 We took a bit of a break at this point and just enjoyed the view that was to be had, while we speculated which peaks we were going to try to scramble to the top of on this day and the next. After we had continued on and were on the pass, we found the trail was beginning to get a bit indistinct. We figured at this point that we would just work our way to the top and make our own trail. For the first while, it was slow going as a somewhat recent slide had left a lot of loose dirt and rocks along the slope and that made for some slippery footing. 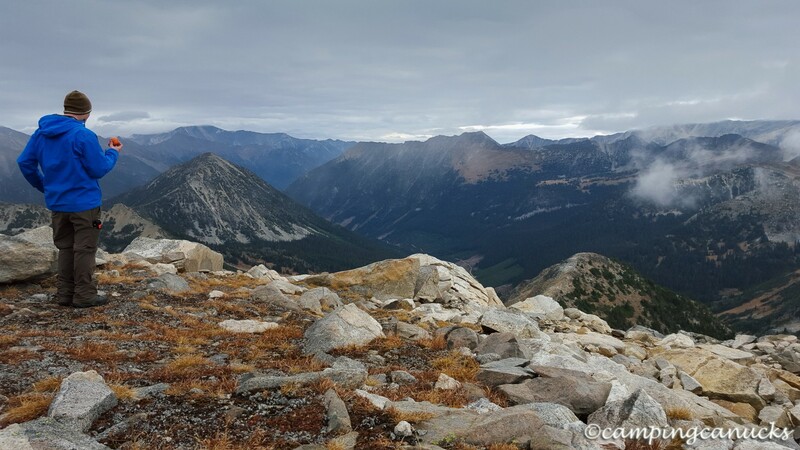 Eventually, though, we reached the older and more stable boulders and we were able to pick up the pace a bit as we continued for the top of the peak. The views continued to open up as we worked our way up and we began to see the mountains of the park in a whole new light. Once at the top, we dropped our packs and just lounged around in the sunny October weather which was surprisingly warm especially since there was very little wind at the top. Lunch came and went while we took lots of pictures, recorded some video, and just generally enjoyed the experience that comes from being on the top of a mountain. 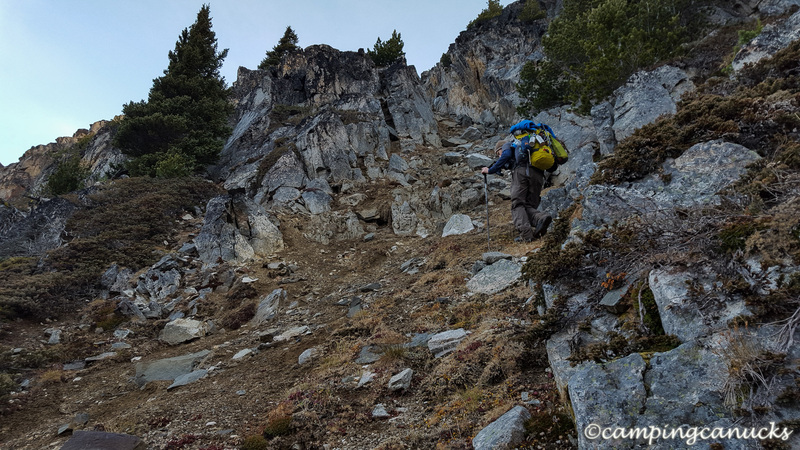 As the morning made its way into noon, we eventually loaded back up and looked for a route down to Brimful Lake. 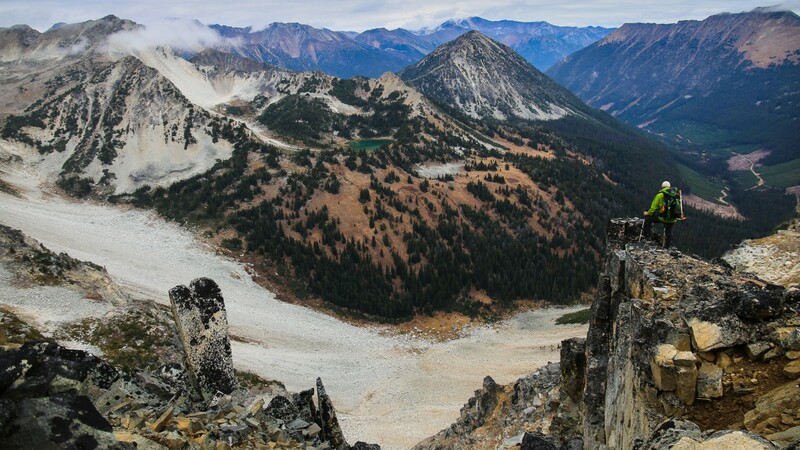 Luckily, from the top of this peak, there was a nice ridge that lead right on down past the lake, so down we went. Most of the way down was pretty straightforward but once in the trees, we found that we had to do a little backtracking here and there as we lost the trail several times. There was never really any risk of getting lost or anything like that but we did encounter some cliffs and steep sections that were just a little too dodgy to go down. It was obvious though, in many places, that people had scrambled up in order to reach the ridge. It was mid afternoon when we arrived at the camping area of the lake. 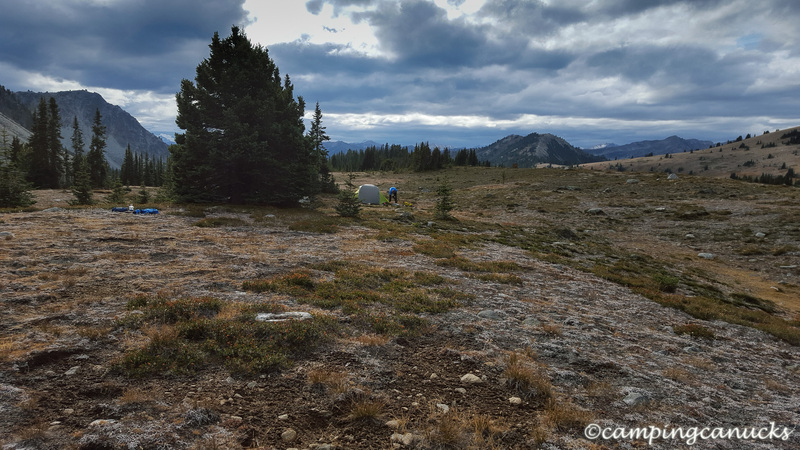 Being that the lake is surrounded by a large meadow for the most part, there are plenty of places to camp. We had decided that we would find an old fire ring and camp somewhere near that. We found there were plenty to choose from as we found over a dozen old fire rings scattered around. As an added bonus, the camp has both a toilet and a food cache. The toilet is the somewhat exposed ‘throne’ style but it was still appreciated. It wasn’t quite a sunny at this point in the day but still fairly warm unless we exposed right to the wind. Fortunately, we were able to find a fire ring built in a depression that offered good protection from the wind. And after a bit of wandering around, we found a lot of old and dry wood from a slide that had wiped out a bunch of trees at some point. With that, we were able to have a nice large pile of wood for a fire as we got ready to settle in for the night. With our early start that day and the somewhat rigorous hike to the top of the mountain and down, we were in bed fairly early. It was quite a surprise to wake up to a mild morning the next day with the thermometer reading four degrees. Considering it was mid October at 2200 meters, we had fully expected it to freeze during the night. Regardless, we started up the fire again and enjoyed hot drinks and breakfast while we waited for the sun to rise. By the time we were packed, the sun was coming up and we considered our next move. The previous evening we had decided that we would go almost due east right up the side of the mountain beside us, aiming for a ridge that we could see from our camp. We weren’t sure quite how doable it was going to be, but neither of us really wanted to backtrack the way we had come in. After crossing a boulder field left behind by a slide, we reached a point where we could see a narrow chute going up. It looked doable, albeit steep, so we carefully made our way up, taking care to not knock rocks down on each other. It was a slow going but footing was quite good and we found ourselves in another slide path once we made our way through the narrow section. We were also greeted by the sun about this time. On the flip side, this was also about the time that the clouds began rolling in so we ended up in the fog for a bit. It turned out that our ‘shortcut’ had led us almost to the top of the peak so it wasn’t long before we reached the top. On this day, though, it was cold and windy so we decided to go down to a lower peak for a break before finding a route back down the valley. 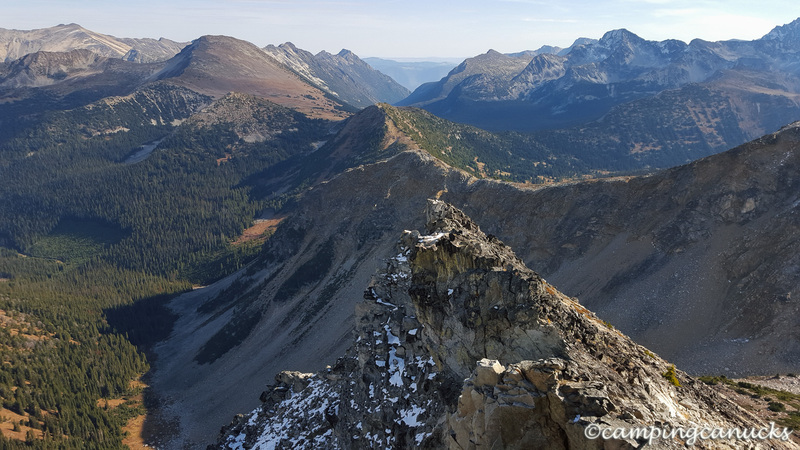 We wandered around for a bit after we took a break and were able to find a route along a ridge running to the northwest that we hoped would take us down. We also managed to startle the only wildlife we had seen on this trip – a ptarmigan – but neither of us had our cameras handy, which was too bad as we were able to approach within six feet of it and could have had some great shots. Here and there on our way down, we passed signs that people had traveled along this ridge before; a boot print, a scuff on the rocks, and the occasional cairn. Much of it was easy going but we did eventually reach a part that was damned steep and that we had to traverse. It was tricky but being that some of the trail was in the trees, there was usually lots to grab onto. Eventually we came to a large slide path where we figured we would head back down to the road. There were no real trails at this point so we knew that some bushwhacking was going to be needed once we cleared the slide area. With that in mind, we worked our way down to a spot where we figured it would be shortest for the bushwhack. Once we were back in the trees it didn’t seem all that bad in the brush but before long we found that it was choked with small trees and shrubs and it became more difficult. I can’t say that I will ever really like bushwhacking through dense brush but sometimes it is necessary. It took us a bit of time to clear the forest but we did find ourselves back on a logging road before too long and walking the last few kilometers back to the truck. 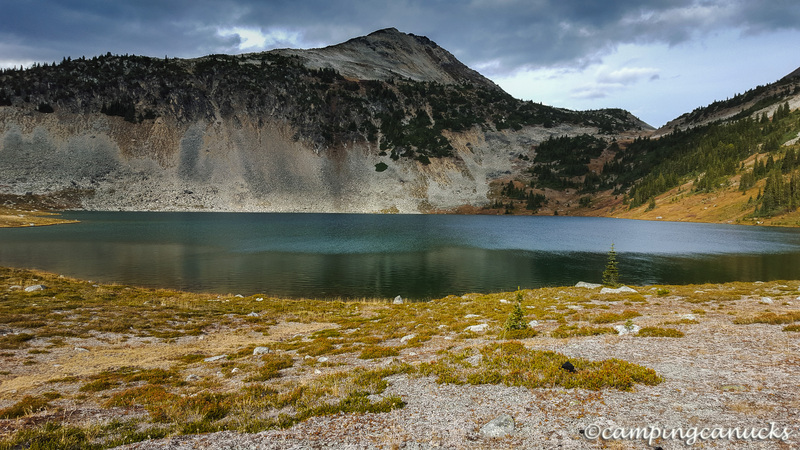 The Brimful Lake Trail turned out to be quite a nice surprise and we really enjoyed this trip, particularly since the weather was nice and we were able to bag a couple of peaks. 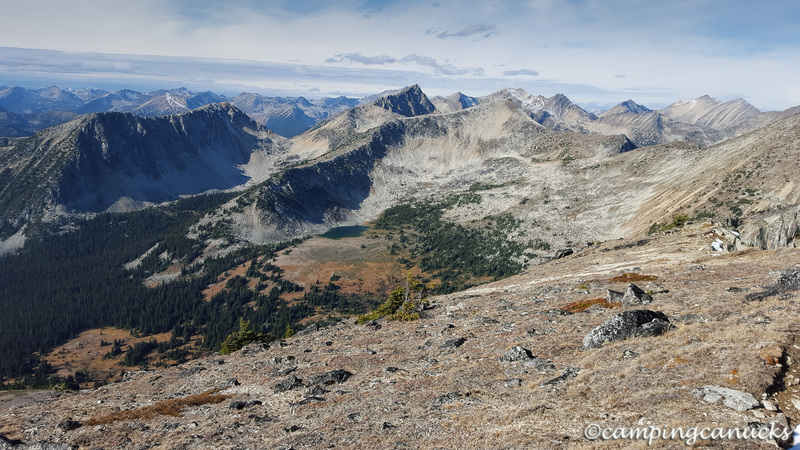 We do look forward to coming back here again someday when we have more time to further explore some of the other peaks and ridges in the area, and see where they may lead us. For anyone considering a trip into this area, we certainly recommend it. Do be aware, though, that you might not be able to drive to the trailhead and will have to walk for a bit to reach it. Also consider that much of what we did was off trail and that we just picked our routes as we proceeded. Anthony has also posted a video on Vimeo of our trip.